she’s caught my heart, this one. she pays no mind to wind or windchill. no mind to season. or slant of sun. or the fact that all around her, the garden’s gone to sleep–shriveled, bent and altogether spent. not this one, though. she’s bright-eyed, bold, and taking her sweet time. she is my forget-me-not. and i won’t. she’s the last one standing in my garden. there are others fallen, faded, dangling, dozing. but she is clearly on a clock that’s all her own. she seems emboldened by the going-down of all her once-steady companions. the dusty rose is somber now. the black-eyed susans, crumbling back to earth. the feverfew is chilled. but not my stalwart one, uncompromised by calendar. i’d been charmed whole weeks ago, when, as i was raking up the muck and tossing shredded leaves for winterkeeping, i’d noticed how she was shooting toward the sky, paying no mind to the fact that summer had passed her by, and she was just now considering a bloom. i have no clue what she’d been thinking all summer long. must have been lolligagging to her own melody. you see, i’d planted her from seed. a hundred thousand hours ago, or so it seemed, back when snowdrifts still clung to my kitchen window box, and i needed seed to sow for the promise that it holds. 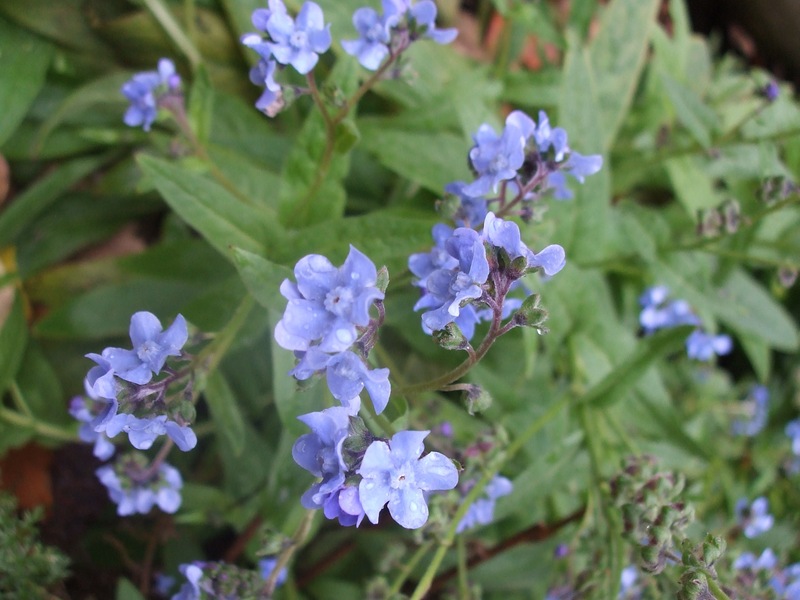 i’d tucked those itty-bitty myosotis sylvatica seeds–think poppy seed, then divide by five and you approximate the size–in a little pile of potting soil, inside a little potting cup, and set it on my sill. i’d watered, and hoped. and waited. wasn’t long before i saw the itty-bitty bits of green. good morning world, they seemed to mumble, as they stretched their necks and arms, yawned and met the day. in time, they grew strong and hardy enough to tuck outside. but i forgot to read the itty-bitty words on the back of the seed packet, so i planted them smack dab in the sun. which, of course, they don’t like so much, preferring where the shadows fall. being on the shy side, demure even, they never did complain. just took their holy blessed time, i suppose. took till september till i saw much of any action. and that’s about the time my friend-in-the-making jutted cloudward. and then, not long after that, she sent out little spurts of blue. a blue so pure it could melt you. if blue was butter, this would be that blue. meltable blue. not shocking, not cobalt, certainly not navy. mostly rather like the color of september sky, on the days when the whipped meringue of cloud is the only interruption in an endless pool of, well, forget-me-not blue. and so, she kept it up. the later it got, the closer the earth and sun moved to the equinox, the more insistent she became. she was hellbent, apparently, on blooming, and she was not about to let a little frost get in her way. fact is, just the other morning, i awoke to winter’s thin-veiled hint that it was coming, not far ’round the bend. the hoary frost was stretched from limb to limb. blades of grass stood still at frozen white attention. gutters glistened with the first icy crystals of the dawn’s deep chill. by now, you’ve caught her drift, so i hardly need to tell you that she was, of course, tall and pert and going strong. all day she seemed to be whistling. look at me, she called. i can’t be felled. not by something so ephemeral as a frost that melts by 9 o’clock. in the morning, mind you. and so, as i wobble through these days that try me, i am inspired, braced by the forget-me-not that did not forget to bloom. so what if she wholly skipped the part of the instructions that promised she would explode in blue before the pumpkins came? is she not all the more exotic, rare, cherished, for the fact that she alone trumpets in my sleepy garden? she stands in glory still, bless her, reminding me at every turn, that there is holiness in minding your own rhythm, in standing on your own, in paying no mind to what the others choose to do, or how or when they do it. she is prayer on a stem. she is defiant, and i find her humbling. there is in my garden a stalk or two, each one ending in the bluest blue. and she is, oh, yes, my sacred blessed testament to a dream that refused to die. i’ll not forget her. i promise that. have you caught the whisperings of some living thing that seems to hold a necessary truth? is there a tree out your window that reminds you to stand tall against the winds? is there a mountain rising that always catches glint of sun, or a brook that meanders, takes its time and turns, but always runs toward the shore where it is freed to cross the globe? do you, like me, find firmament in the natural world? do you allow an itsy bitsy flower to speak to you, imparting wisdom you need to know? maybe i should have noticed, clear up and down my street, far as i could see, i was the sole soldier armed with rake the other afternoon. maybe i should have sniffed out my sisyphean traits before snapping up my old down vest, slipping on my red woolen mittens. maybe, had i not been so deeply lost in sheddings from on high, i might have caught on earlier to the pathetic notion that every time i’d piled up a meager, humble, pitiful excuse for a heap, the wind blew. oh, i don’t mean a little whuff of air. no mere ruffling of the fallen oaks and ginko droppings. no, ma’am. this wind was making like the big bad wolf in every scary fairy tale. it was hungry, and it was howling. made snacks of all my measly mounds. snickered slyly, i now surmise, as i shook my stick and raked them back again. it was in the middle of, say, my 88th attempt to get the misbehaving leaves lassoed back into their corner, that it dawned on me, just what a fool i was. and how very often i–and maybe you and you–attempt to rake a rodeo of leaves on the blusteriest of days. don’t we, some of us, exhibit quite a knack for doing life the upside-down-and-backwards way? aren’t we inclined, some days, to try to mow the meadow, one blade at a time. with cuticle scissors, besides. why is it that we put ourselves through what my gramma called the wringer? why, i wondered, do i decide it’s high time to neaten up the yard, on the very afternoon the winds blow at 50 miles per hour? but then, while dried-up wrinkled bits of autumn’s gold and crimson garb cascaded all around me, while i raked and raked until my shoulder ached, and then my back joined in, i found to my surprise that i rather savored getting lost in the eye of that leafy swirl. so what if i alone saw fit to exercise the rake that windy, windy day? so happened that my place beneath the trees that howling afternoon brought me what can’t be shoved in leaf bags, or carted off in croupy trucks. not only was the whipping of the wind whistling past my ears in melodies i might have learned to hum along. not only was i standing there alone, chuckling, frankly, at my certified absurdity. it dawned on me, like a branch klonked on my head, that were it not for my up-churned piles, and the evidence that scattered with every darn-blasted gust, i’d not be witness to the choreography of air in flight. that very thought stilled me. for years now, i’ve had a rabbi in my life who posits this as proof of God: have you ever seen the wind? he asks, thus setting up the paradigm for what he suggests is knowing the unknowable. question two, according to the rabbi’s logic, always is: why then do you think you need to see to believe when it comes to the Holiest of Holy? i’d barely thought the thought when i saw, quite clearly, the divinity in the honey-locust castings. it is the very leaves themselves, quarter notes climbing the C scale, playing loopdy-loop around my thighs, my waist, my ears, that bring to life the ebbs and eddies of the wind. i see the wind in the blowing of the leaves. i see God, then, in the messy world that won’t be raked in piles. i see, that is, if i slow down long enough to notice the air ballet that swirls around me. i see, that is, if i don’t insist on battening down the scattered shredded bits. maybe the point of raking, after all, that windy afternoon, was to discover the messiness of joy. or, perhaps, the joy of messiness. maybe ours is not supposed to be a yard–or life–that’s manicured, a grassy carpet vacuumed leafless. maybe rather, we stumble on the richest riches when we stop amid that raucous riot of the day-to-day, and recognize the one who choreographs the wind. and stirs the music in the simple raking of the fallen leaves. it’s late, and once again i am bone tired, but unwilling to let a wednesday pass me by. 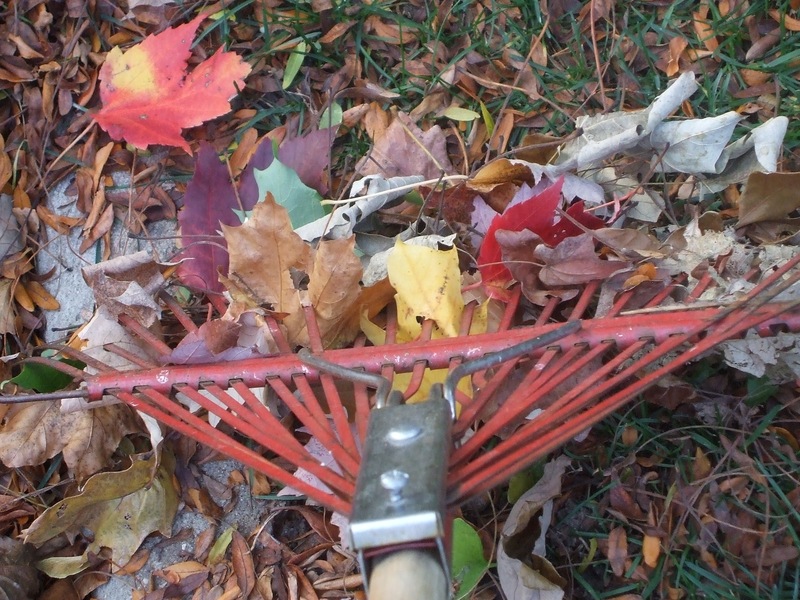 do you, like me, try your hand at raking–or any other chore that must be undertaken–on the unlikeliest of days? when winds howl, and you’d have to be a fool to try to gather weightless leaves? and, despite yourself, do you sometimes stumble onto discoveries that could only be divine? these might be called the sawdust days–dry and rough and shaved into crumbles. some nights i fall into bed, thinking, hoping, praying maybe my tossings and turnings, the brackets in between sleep, will clear out my head and my heart and my soul. but then i wake up in the morning, flop my feet on the floor, feel the twinge up my leg. and the one that toys with my heart. the one that weighs me down. oh, it’s all sorts of somethings. the news from the box by the side of the bed, the one i ought to change, maybe, to mozart instead of the global markets’ collapse. then there’s the news that comes folded on paper. the one that’s paid my paycheck all of these years. the one that brought me my truelove, and both of our boys; double bylines, we call them. that ol’ paper brought me half the friends of my life, if i stopped and started to count. brought me nearly every adventure. brought me to the foot of heroes, known and unknown. brought me dinner tables brimming with stories. brought a skip to my heart. brought me the nearest thing i ever felt to glory be: the miracle of seeing words typed in the near-dark or the fluorescent glow of the newsroom, tumbled onto the next morning’s headlines, onto the stoops and the bus and the train cars, the glory of feeling pulled–on a broomstick to heaven, so help me–to tell in plain words a life-changing story. can’t tell you how many times the life that was changed was mine. these days, though, i seem to be mourning. i’m caught, somehow, between what used to be news and how it works now. not sure if, in all of those pages, there’s a place for what i do best. or, at least what i love most of all. so it is that i walk through these hours, sometimes aching and oftentimes wincing. i swallow back tears more often than anyone knows. and i gather up grace, wherever it falls. i’ve been through these kinds of days before. i’ve learned what it takes. the one sure, holy equation. i’ve listened long and hard to wise souls all around me, ones who, too, for one reason or another, have tasted the dry crumbly dust in the mouth that comes with most kinds of grieving. it’s these stretches of days when time ticks, but then loses its place. the tock comes, but not quite when you need it. you’re lost in your head–or is it your heart–as you strain to untangle the knots, see through the haze. time clearly is warped, and so is your sense of the surest way home. on those kinds of days, when your feet weigh you down, and your insides do too, there’s only one sure cure to propel you into the light. it’s grace gathering, pure and simple. and its holiest spark is how it comes cloaked in the plainest of cloth. doesn’t come at you blinking and beeping and flashing bright lights. you just lay down a footstep and find that you’ve entered compartments of grace. just today it came in cinnamon toast, studded with raisins, slathered with butter and drifted with mounds of cinnamon sugar. 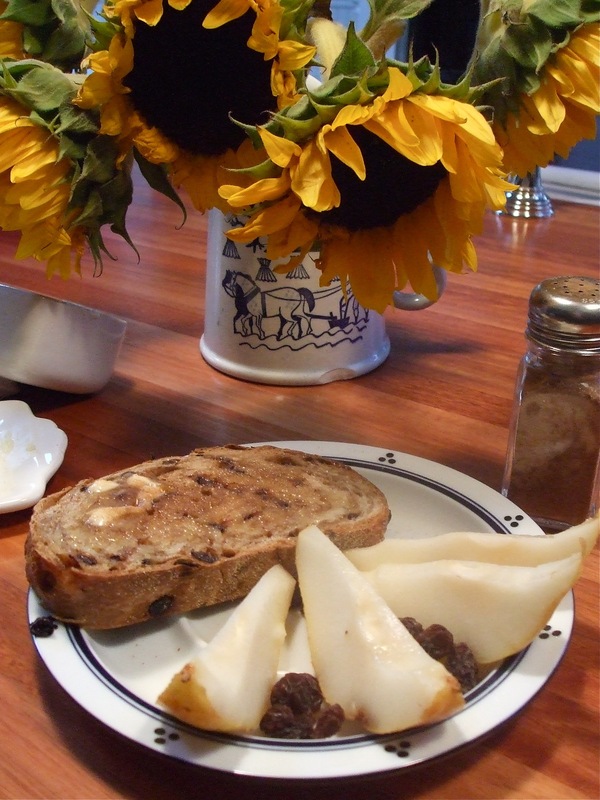 that toast shared the plate with a pear, sliced and juicy and waiting. for someone. my little one, the one who brings me grace by the gallons these days, he was due to bound in the door any minute. i too had just stumbled in, as a matter of fact. day before, i’d plain missed the after-school hour, typing away at my faraway desk. i could’ve skipped right over the moment, the chance, the grace in the wings. could have mad-dashed back to my desk. back to the work that’s never quite done. but then, without folderol, without the trill of a drum, those scant few minutes–the ones when the backpack is shed and the stories spill fiercely–they invited me in. come, come, they whispered. partake. take a moment, lift it up from this everyday altar. break bread. then, while you’re at it, they must have insisted, take it and toast it. lay it out where he’ll see it, where he’ll know in an instant: she was waiting for me. my mama, she knows how to feed me. and so, grace descended on us, wrapped us, tight in the blanket of side-by-side comfort. grace is balm for the soul. it feeds us in places that growl out in hunger. it moistens the parts that are parched. grace is the prayer beads we string in a row. the rosary of life lived at attention. it’s the layer of soul tied to the divine. and it comes unannounced most every time. it comes, yes, in cinnamon toast. it comes, too, in the molasses light of october, the way it catches there on the last dying petal of the black-eyed susan i stubbornly keep in the vase on the sill. it comes in the moon playing peek-a-boo behind the whipped-cream swirls of the clouds in the nightsky, a frolic so wholly delicious you stop on your way to dump out the trash, and next thing you know you’re humming along with all of the stirrings that come from the boughs and the bushes–a rhapsody you wouldn’t have heard, wouldn’t have taken in gulps, but for the something called grace that slowed you and held you. and seeped in through the cracks. it comes, grace does, like the brush of the great palm of God, there on your brow. be filled, it urges. take heart, it commands. the world is more than you know, more than you see. there is, at work every hour, a layer of beauty and truth and infinite wisdom. and gather it greedily. it’s there for the hungry, the thirsty, the aching. it’s there for the ones who believe. and it’s there for the ones who barely remember. how does grace find you these days? do you find yourself in steep need of that holy tap on the shoulder? i hung them one by one. all my grown-up years, and long before that, i’ve been drawn to stories and people and places that might not otherwise make it to the map. except i couldn’t keep away. time and again, i went looking, in soup kitchens and out to reservations. in tenements where the halls were pitch black and, excuse me, smelled like pee. in rooms so loosely laced together the wind blew through, flickered a candle’s flame. to the maw of a cardboard box that, night after night, was home to a fellow who went by the name of dirtman. each time i stopped, stayed long enough to soak up the story, i carried home, always, a black-and-white, an image in my mind, but one on glossy paper, too. they were, each 8-by-11, or 11-by-14, the raw stuff of why i did what i did. why i boarded planes, all alone. why i drove to corners of the city where a smart girl–a safe girl–would not go alone. back then, i burned the flame and believed with all my heart. it was a holy calling, i was certain, to tell the tales in words that wouldn’t dim. not inside my head, for certain, and maybe not even in the newspaper that one day would yellow, some day would surely flake. it was my inspiration wall, the hodge-podge of pictures whispering to me, every time i passed: this is why you do what you do. do not let them be forgotten. do not let their stories fade away. do not turn your back. do not, do not. every time i moved, i packed them up, and found another wall. i need no prize. no medal or honor. i have my wall, that’s all i need. in this old house, they’d not found a wall. even though i tried. instead of hanging them, one by one, they lay dusty on a shelf downstairs. turns out, i think i found a wall. you see, the place i work, well, they called me back to the big tall tower. told me just the other week that my 15 years at home is over now. since my firstborn was a baby, i’ve worked right here, where i could hear my boys, no matter what i typed, no matter who i talked to on the telephone. there were times it got messy. babies cried and fussed, no matter who was on the line. dinner burned while i typed one last sentence. it got to be, that’s just the way it was. i only knew how to be a mother who worked right from the nest. i forgot how to be a writer in a room of so-called grownups. but now, not only home will be my writer’s roost. at least one day of my three-day work week, i now need to take a train. a spare cubicle now sits, my name pasted onto paper, hung on the half-wall that now is mine. in case you’re not here in town, you might not know, but the newspaper where i’ve worked for the last 26 years, it’s not the same. it’s, um, bright and bold. some say it makes them dizzy. all i can say is, well, please don’t give up. and since i’m now tucked away in the little square far away from where i’d rather be, and since i’m rather at a loss over the lack of room these days for storytelling, it dawned on me quite suddenly that, more than ever, my wall needs to rise again. 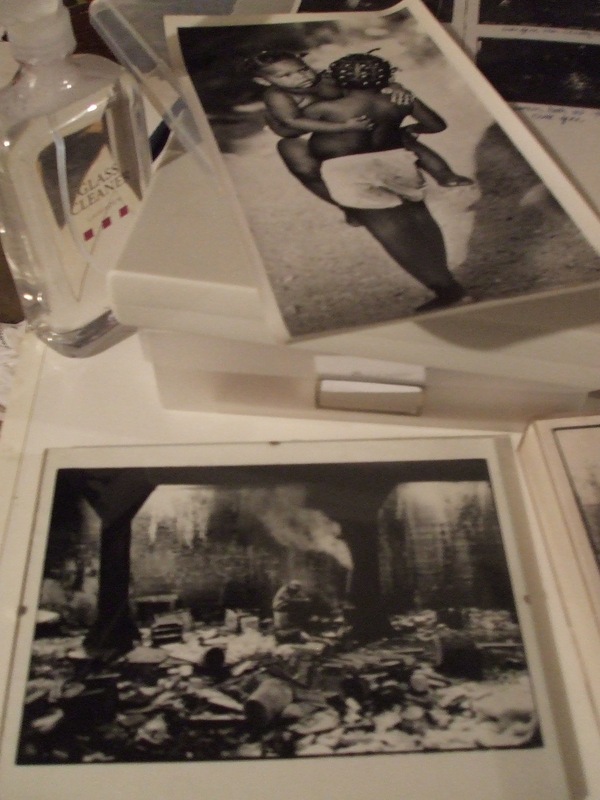 i was down in the basement just this morning, dusting off the stacks of pictures, each one tucked in a clear plastic frame. it’s nothing fancy, nor should it be. there are stories to be told, and places on the map that mustn’t be overlooked. do not forget the forgotten. do not turn away from the ones with nowhere else to turn. it is inspiration i unearthed. and a holy flame i won’t blow out. the darkness threatens, but my black-and-whites will light my way. how do you pin up inspiration in your house, or in your life? what is it that stokes your flame, and reminds you, day after day, just why it is you’re here on earth? on a good day, the end begins by the time the little hand kisses the 9.
all’s done, on a good day, that needs to be done. that’s the sweet hour when the sigh of my soul finally escapes. when the fat puffy cloud over my house, if my house was the star of a comic book, or a strip in the funny papers, that’s when the letters, emphatically strung into a word in the comic-book cloud hovering over my house, would spell out, quite bluntly, a short simple PHEW! that’s the sound of my deep inner someone hanging it up, when at last the long mighty march through the day is a wrap, packed up on a shelf, over and out. al dente, as long as we’re at it. the little one, on a good day, would be upstairs in his bed (at least till the first or second or third question pops in his head, and he tiptoes down, slithers ‘round corners, makes like a mouse and scares the behoozies outa me and the page i’m now ripping from fright). the dishes, they’d be tucked on the rack, their smeared little bits drying, waiting for rushes of hot sudsy water. my long list, on a good day, is, by 9 in the nighttime, as X’d and checked and crossed off as it ever will be. till the morning comes, and it all begins all over again. on a not-so-good day, a day like the ones that’ve been strung together of late, knots on a rope dangling there in the seas, while the ship tosses and the winds whip and the lightning cracks through the black of the sky, on a not-so-good day, the end’s nowhere in sight. might not be, even at the bewitchingest hour, when the little hand bangs into the 10, when the news squawks from the box, when all good children belong in their beds, and dreams should be well underway by that two-digit hour. these days, though, seems the only way to get it all done, all the things that simply must be attended to, muscled, corralled into order, is to stretch the day. let it leak into the night. let one day ooze into another. pay no mind to midnight, you late-night marauder. then, maybe, by the time your head flops on the pillow, by the time your bones groan as they stretch east to west, north to south, on a plane as flat as kansas when the wheat’s been mowed, maybe you’ll have just a wee slip of a sense that your day inched close to edge, to the place where what needed to be done, finally was. or at least came close enough to let you fall into slumber, relatively guilt-rinsed. that’s the sort of day it was today. my list was long, and i started early, and still i did not get to where i needed to be. the light high on the hill still shines, and i’m miles away. been that way, day after day of late. new job, plus a few assorted oddities, making me feel like a cook in the kitchen with pots and pans being tossed at my head. orders barked. someone wants toast. hold the butter. but the bread wasn’t stocked on the shelf. so you head out to the store, and on the way home, you fall in a puddle. bread’s all soggy, so you head back again. by then, customer’s mad, stormed out. so when you serve up the toast, at last, all un-buttered and sprinkled with cinnamon sugar, the table, it’s empty. ‘cept for a crumpled-up napkin, and not a penny in change. so all the things that i love, the ones that bring me pure joy–catching up on the day with my boys after school, feeding the birds, plucking the heads off my blooms once they’re fallen–all those things, i barely can do any more. oh, i do ‘em all right. but condensed, hurried, panting for breath. this world is like that too, too much, and too often besides. i think, every day, of the legions of mamas who never do have the chance to go slow. who, day after day, rush and hurry and juggle and spin on their heels. i worry. ‘bout a world that mostly doesn’t slow down. ‘bout the buzzes and beeps and the phones that would ring all through the night if not for the holy blessed button that clicks it all off. i worry about a world that has no more time to sit and to pore over the news of the day. has no time to wait for the schoolbus. or to be at the door when the backpacks come tumbling in. i worry ‘bout little hands left to cut apples all on their own. and stories that don’t get told, and worries bottled inside till the nighttime comes, and then mama’s still working, so please rush up to bed now, it’s late. you need your sleep, and i need to keep working. so goes the refrain. 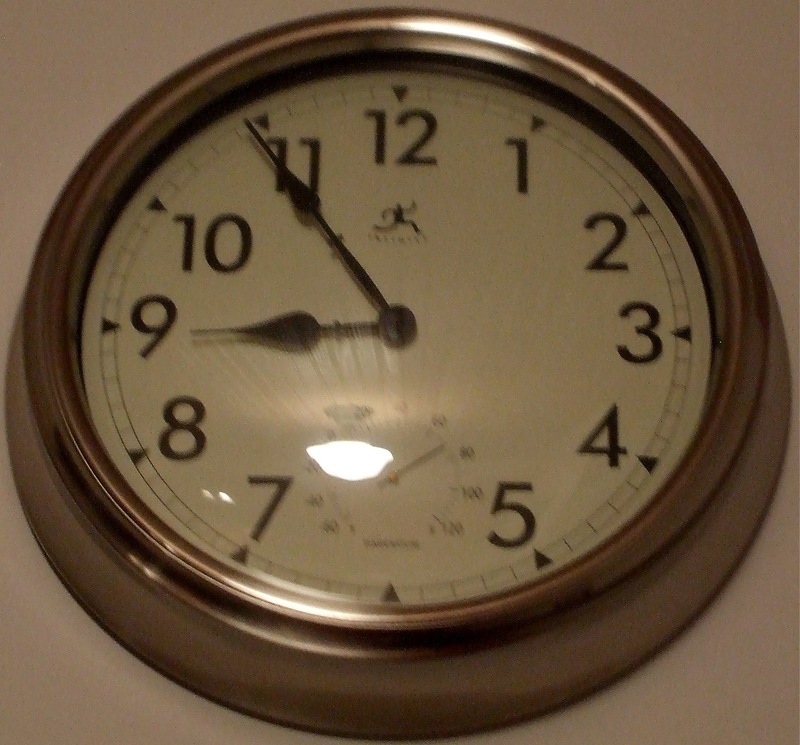 i worry when 9 ‘clock comes, and then 10, and still it’s not over. a soul can’t go for hours and hours on vapors and promise. a soul, and the heart that goes with it, needs down time. the blessed interlude between full-throttle day, and restless tossing and turning. when the day runs out of hours, so too does the light that burns deep inside. i’ve not got the answer. only the questions. what kindles the light, when the day runs out of its hours? where comes the poetry, when all we can hear is the panting of a day, a day racing toward a finish that never quite comes? soon as it’s still, i’ll listen for answers. i know they come, soon as it’s quiet. dear people, i had every intention, really i did, of telling a fine story, one i collected for work but couldn’t quite tell. i’ll try, one of these days here, to unspool it. but in the meantime, tell me, do you have day after day that runs out of hours? where do you find your solace, your stillness? i found mine, at least for a few hours, in synagogue just yesterday. these are the days of awe, and awe is just what i need, what i hunger for….how ‘bout you?